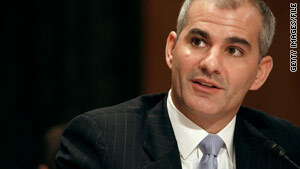 Michael Leiter has served as director of the National Counterterrorism Center since November 2007. With today's release of the Obama administration's report on what went wrong to allow a Nigerian man to allegedly board a U.S.-bound flight with explosives, top government officials including Leiter, director of the National Counterterrorism Center, will face increased scrutiny. According to the Web site of the National Counterterrorism Center, the NCTC has two core missions: "The first is to serve as the primary organization in the U.S. government for analysis and integration of all terrorism intelligence. In this role Mr. Leiter reports to Dennis C. Blair, the Director of National Intelligence. The second mission is to conduct strategic operational planning for counterterrorism activities integrating all elements of U.S. national power. In this role he reports to President Obama." On Wednesday, the NBA commissioner took action against Washington Wizards guard Gilbert Arenas by suspending him indefinitely without pay. Arenas is being investigated by federal and local authorities for bringing guns to the basketball team's locker room. Sports Illustrated reports that Stern was displeased that Arenas had joked about the incident on Twitter. "The possession of firearms by an NBA player in an NBA arena is a matter of the utmost concern to us," Stern said. "Although it is clear that the actions of Mr. Arenas will ultimately result in a substantial suspension, and perhaps worse, his ongoing conduct has led me to conclude that he is not currently fit to take the court in an NBA game," Stern said in a statement. The commissioner's bio is posted on the NBA Web site and begins, "David Stern leads a league that is a model for professional sports in league operations, public service, global marketing and digital technology. Mr. Stern was unanimously elected as the NBA's fourth commissioner and began his tenure on February 1, 1984." C-SPAN, in the words of Politico.com, "has emerged as an unlikely player in the health care debate." Lamb, the CEO of C-SPAN and a ubiquitous presence on TV, sent a letter to Democratic and Republican leaders of the House and Senate requesting that final negotiations on the health care legislation be carried on the public service channel. So far, GOP lawmakers have wanted the negotiations carried on TV, while Democrats are resisting. "Let's be clear," House Minority Leader John Boehner, R-Ohio, said in a news release yesterday. "Skipping a real, open conference would shut out the American people and break one of President Obama's signature campaign promises." According to its Web site, "C-SPAN is a private, non-profit company, created in 1979 by the cable television industry as a public service. Our mission is to provide public access to the political process. C-SPAN receives no government funding." Lamb, who has served as CEO since he helped create it, worked at Indiana radio and television stations while in high school and college, and once hosted a local "Dance Date" TV program. The dancing continues. The man who does the math for President Obama acknowledged Wednesday fathering a child out of wedlock. The confirmation came less than two weeks after he announced his engagement to another woman. Orszag, the Office of Management and Budget director, and Claire Milonas, the mother of the child, released a statement announcing the birth of their daughter soon after the New York Post reported the news on its Web site. "We were in a committed relationship until the spring of 2009," Orszag and Milonas said in a joint statement. "In November, Claire gave birth to a beautiful baby girl. Although we are no longer together, we are both thrilled she is happy and healthy, and we would hope that everyone will respect her privacy." Orszag recently announced his engagement to ABC News correspondent Bianna Golodryga. The Most Intriguing List (that's what you're reading now) is about to give the president of the Weatherproof Garment Company even more publicity, and it appears that's just what Stollmack likes. The New York Times reports that Stollmack recognized one of his company's raincoats on President Obama in a photograph taken at the Great Wall of China in November. The company licensed the image from the Associated Press and on Wednesday plastered it on a billboard over Times Square in New York City. It's clearly the president in a raincoat -- and the caption reads, "A Leader in Style." The White House's traditional position is that images of the president and first family are not to be used to advertise products or services. The Times says Stollmack is likely to hear from the White House today.